James Whiteside. Photo by Nisian Hughes. American Ballet Theatre (ABT) Principal James Whiteside is not your stereotypical premier male danseur. He’s got an edge. 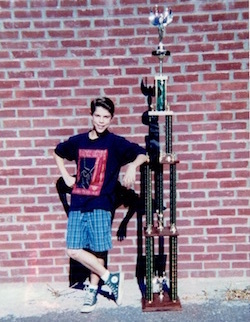 Whiteside started as a competition kid, training at the D’Valda and Sirico Dance and Music Centre in Fairfield, Connecticut. He didn’t go away to ballet school until he was 16, but his teacher, Angela D’Valda, says he was a wonderful student with definite potential – good muscular structure, musicality, a strong work ethic and immense creativity. But he was also “an extremely good kid tied in with a touch of mischief,” she describes. James Whiteside. Photo by Ballet Zaida. Whiteside has since blossomed into a star, and he credits his competition roots for making him successfully viable. He has been cast as every male lead in ABT’s classical ballet repertoire. He’s got over 116,000 Instagram followers to toot, yet he humbly says he’s just “a human”. And he leads a fulfilling life outside of ballet, performing as pop/dance artist JbDubs and as a member of drag queen posse The Dairy Queens. To top it all off, he’s laid back and funny. What is not to love?! Next up, Whiteside performs in ABT’s colorful new ballet, Whipped Cream, choreographed by Alexei Ratmansky and with scenery and costumes by surrealist artist Mark Ryden. With all of Whiteside’s goings-on, we had to learn more about him. Here, read on about his journey and positive outlook on dance and life. His wide-eyed spirit is infectious! At what age did you start dancing, and what got you into it? James Whiteside. Photo courtesy of D’Valda and Sirico Dance and Music Centre. What dance styles did you study when you were younger? And you were a competition kid? What was that like? The competition circuit is much different than the serious classical ballet training. When did that shift for you happen? What drew you into the ballet world? Do you think your competition background had any benefits to your career, and/or did it hinder you in any way? James Whiteside. Photo by Daniel Moss. What do you think of Alexei Ratmansky’s new ballet, Whipped Cream? It looks wildly colorful and intriguing, with its colorful sets and costumes! 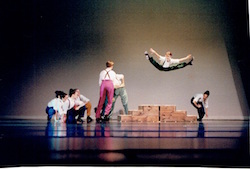 What makes this ballet special? What’s it like working with Ratmansky? What are some of your favorite roles? And do you have any dream roles or ballets? You have a huge social media following and presence, and I’m sure you’re an inspiration and role model to many younger male dancers. How does this make you feel, and what would you like to say to your followers? You also lead a whole other life outside of ballet – you’re also a pop singer and a drag queen! How do you do it all? And why do you do it all? How do all of these ‘identities’ make you complete? James Whiteside as JbDubs. Photo by Jaqlin Medlock. What’s been the best piece of advice you’ve received? What do you want to say to readers? James Whiteside. NYC Piece Of Me. Photo by Nisian Hughes. Catch James Whiteside and the dancers of ABT in Whipped Cream, which runs through July 1, at the Metropolitan Opera House. For tickets, visit www.metopera.org/Season/2017-abt/Whipped-Cream. And for more information on Whiteside, head to www.jameswhiteside.org.